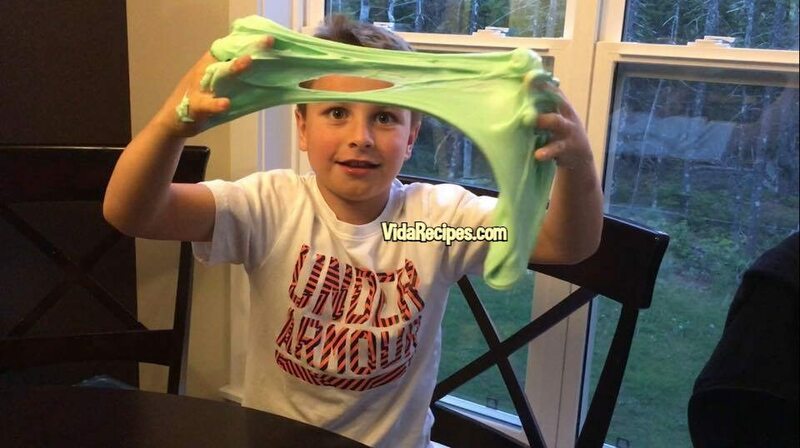 This is a very cool and easy to make fluffy slime. It will easily entertain your kids for hours! Great summer craft. DIY Fluffy Slime – Great Summer Craft For Kids! My kids loved making this fluffy slime and playing with it! Measure glue and baking soda into a bowl and mix together. Add shaving cream and mix together. You can add food coloring next which will give your slime a nice color. We used green and add enough food coloring drops until you have your desired color. Next you will add your contact lens solution. I used Opti Free. The contact less solution will make your slime less sticky and much more workable and easy to play with. You can also use borax, but i used the contact lens solution be cause it is safer for kids. It will take 1-2 teaspoons of contact lens solution. Just add a few drops at a time until your slime is easy to handle and less sticky. Enjoy! Slime can be stored in a sealed container to last longer when you are done playing with it. Check out a quick video on how cool this slime is! You can make your fluffy slime any color!